Since Larry Page has become CEO, the company has become more focused that ever. His philosophy of more wood behind fewer arrows seem to be at work here. Where there are a lot of casualties in this philosophy (like Google Reader), integration of various services has been a major boon of this logic. With the launch of Android Wear, Google had launched its Google Now platform to wearable devices. 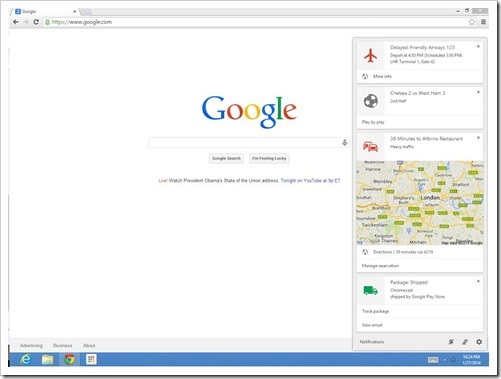 Now, Google is bringing “Google Now” to Chrome, thereby bringing it to both Windows and Mac. It was first introduced in Chrome Canary in April 2013 but became usable in January this year. Finally, now it is here in the stable channel for everyone to use. To use Google Now in chrome is very easy. All you have to do is sign in with the same account that you use in your Android phone. For most users this is their primary account and I believe will be something that will happen automatically if Chrome is their primary browser. The biggest advantage of Google Now, the Now cards will also be available albeit they will be simply the subset of the mobile cards. Also, for cards that are location based, the location will depend on the location of your mobile phone. However, if you do not want to use Google Now, despite being signed into the account, you can simply uncheck it from Chrome Notifications in your Computer. It is present in the lower right corner in Windows and in upper right on the Mac. Just click on the settings (gears) in the notification and you will find all the extensions using the notifications from Chrome. With Google Now, Chrome, which is already one of the best browsers in the world has leaped ahead of the competition. Also of note is that these features are not something that other browsers can easily provide. For example, Windows have a platform for both mobile and PC but the mobile is not successful enough. Also, they have no alternate to Google Now. For Mozilla, the path is even tougher as the Firefox OS has yet to find any foothold in the wild. As I see it, such platform independence is really powerful. Kindle offers this by Whispersync and it makes their platform the best to read books as you can start a book on a PC, read the most of it on a Kindle and end on your phone. Similarly, with Google Now present everywhere, Chrome should see a boost in its adoption. What are your views?